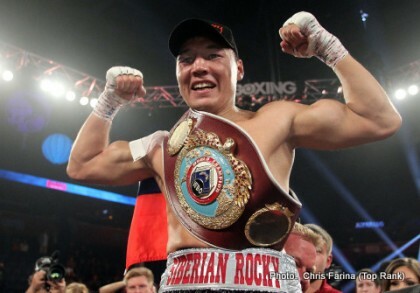 Crowd-pleasing former world junior-welterweight champion Ruslan Provodnikov of Russia will fight unbeaten Jesus Alvarez Rodriguez of Mexico in the headliner of the “Night of Champions” tournament in Monte Carlo on November 7. This bout replaces the WBA championship fight between Juergen Braehmer and Tommy Oosthuizen after the German sustained a hand injury in training. Frantic efforts to secure a highly-rated replacement for Oosthuizen were unsuccessful, although promoter Rodney Berman was delighted to get Provodnikov’s signature. “We are working on finding a new date for the event,” said Braehmer’s promoter, Kalle Sauerland. Provodnikov’s opponent is 23-years-old and unbeaten in 13 fights (although it is understood that five additional pro bouts are unrecorded). Provodnikov (24-4, 17 KOs) has come off a remarkable run of five fights against top-level opposition: Tim Bradley jr, Mike Alvarado, Chris Algieri, Jose Luis Castillo and Lucas Matthysse. “The Siberian Rocky” is a former WBO junior-welterweight champion rated number four by both the WBC and the WBO. His fight against Bradley in 2013 was named Fight of the Year by the Boxing Writers Association of America. More recently, his fight against Matthysse was another candidate for Fight of the Year. On the undercard, cruiserweights Youri Kalenga (21-2, 14 KOs) and Roberto Bolonti (36-4, 25 KOs) will fight a 10-rounder. Additionally, Venezuelan Charlie Navarro’s (25-7, 20 KOs) will meet David Avanesyan (20-1-1, 10 KOs) of Russia for the WBA Interim welterweight belt.